The Giro Men's Hoxton LF Glove features a Merino-blend back with an AX Suede synthetic-leather palm for warmth on the city streets that holds up. 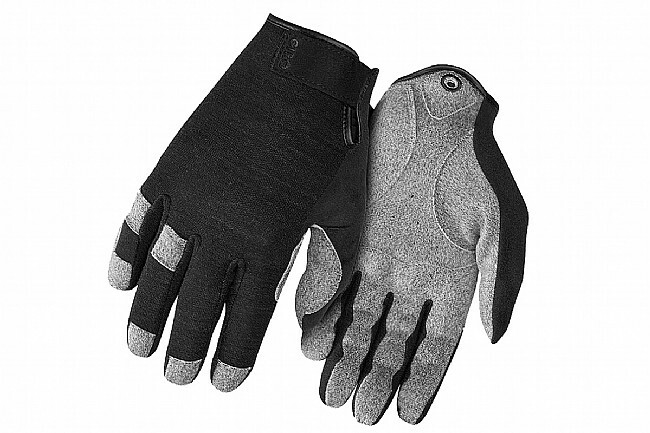 Its Super Fit™ construction tailors the palm and fingers to match the shape and movement of the hand to reduce bunching and increase comfort, and it's secured with a low-profile Velcro® closure at the wrist. Integrated Touchscreen Technology™ makes the fingertips compatible with your smartphone, and the Hoxton Long Finger Glove is topped off with a microfiber wiping surface at the thumb and leather trim. In temperatures in the 40's(F) these are ok. I bought them because of the lead Merino wool and was disappointed to see it was only 9%. With more wool I think they would work into the 30's. (about as cold as I ride). Otherwise they work ok and the fit was accurate (L). Finish is good. I really like these gloves. Comfy and good for cool rides, merino is able to span a wide range of temps without over heating. I also use for driving!